(Nanowerk News) Researchers at Fluorotronics, Inc. (San Diego, USA) have enlightened the role of hydrophobic surfaces in the enhancement of proteins folding. Dr. Bouzid Menaa (Research Program Director at Fluorotronics) said that organic-inorganic nanoporous silica sol-gel glasses constitute the ideal support for protein bioencapsulation and adsorption, and to study the different factors influencing the protein folding process in a crowded environment. Due to the facile silica surface modifications with desired Si-substituted organic groups from organosilanes precursors, organically modified 'wet-aged' silica-based glasses obtained via the sol-gel process, can be used as host materials to mimic the crowded environment of the proteins and cells that can be found in the cytoplasm for instance. Numerous studies to date showed that silica-based nanoporous glasses can stabilise bioactive proteins. However, it is important to know about the different factors affecting the protein stability and therefore its properly-folded state. In the article published in International Journal of Nanotechnology ("Silica-based nanoporous sol-gel glasses: from bioencapsulation to protein folding studies"), they reported how they can mimic the influence of different parameters (such as surface hydration, hydrophobicity, solute effects, thermal stability, porosity, macromolecular crowding) on the protein conformation based on the design and the characterization of nanoporous silica-based materials containing different functional groups (e.g., hydrophobic alkyl, phosphate and fluorinated groups). 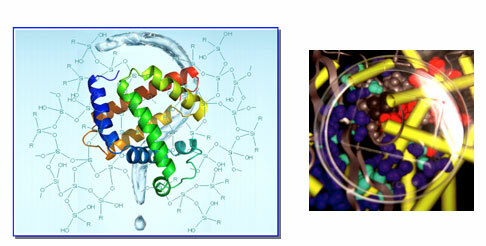 The enhancement of the protein folding owing to the physical properties and microstructure of the host matrix induced by the nature of the functional groups and the siloxane network play a major role on the protein biological activity and therefore to the development efficient bionanodevices such as biocatalysts, sensors, drug delivery systems or implanted devices. It is also the opportunity to understand the different factors influencing the protein misfolding that are the cause of devastating diseases such as Alzheimer or Huntington. The researchers are now aiming to use a new patented method developed at Fluorotronics and known as Fluoro-Raman Spectroscopy to further study the molecular interactions at the biomolecule/host matrix interface.